It was the Dearne District Tramway that got me into trams, especially those English Electric four wheelers. My card efforts have been heading in that directions as there were no over the counter models available. 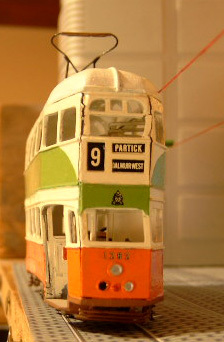 No more, KW models now has a body model of siad tram. Not being one to repeat others efforts if I can help/affort it I was wondering about having a go. However, I have never gone down the white metal route and was wondering if anyone ele has for trams. What is the best method of assembly an holding together. Traditionally it was solder but with modern adhesives I suspect life might be a bit easier. Bodies are £30 and BEC have a suitable chassis. Anyone any experience of white metal trams? While not trams, I've done a few white metal kits in the past using two part epoxy and superglue and it's a slow process to get good results, as the kits require a fair bit of preparation. I sill have a couple more loco kits in stock yet to build and will be trying the solder route this time, as it's quicker and they're supposed to stay stuck together longer! I will however practice with some smaller kits first and use low melt solder, as white metal kits still need a reasonable competency level and much patience to get the desired result. It will be a good idea if you too can practice on something inexpensive to build up your confidence if you're not used to either kit building in general, or white metal kits in particular. In addition to the assembly, there can also be much preparation required prior to painting. However, with a little practice and taking plenty of time over everything, good results can be obtained. Others here will have greater experience than me and I'm sure will offer further advice. I've also only done locos, in N gauge, a variable temperature soldering iron is a must, and also it must go down to 100C or less, white metal from different manufacturers does not always melt at the same temperature most melt around 150C but the Carr's lo melt solder is 70C so. Quite a few variable temp irons only go down to 150C which is too close to the borderline for my liking, a Weller WHS40LT is about as good as they get, but not cheap, this one is well below RRP and quite a bit below what I paid for mine. If you're looking for one after these have gone make sure it's the LT version, the normal WHS40 only goes down to 150C. The only minor gripe I have with it is that the control is not calibrated in degrees, so you need to run tests with different melting point solders or a pyrometer and make your own marks. I've done both railway stuff (locos, wagons, etc.) and also buses and lorries. Although I tend to solder the major bits together I use superglue for the detail parts. I did also put one of the old CCW O gauge white metal loco kits together using super glue and as far as I know it's still running and in one piece. The main thing to remember is to make sure everything fits well and is spotlessly clean before gluing together. I would suggest using one of the slower grabbing superglues to give you a few seconds fiddling time before it goes off. No trams but plenty of white metal kits. Soldering is best, needs a low temp iron, and the correct solder and flux. I normally tack weld first (practice on some scrap pieces) then run the solder in the rest of the joint. The surfaces need to be freshly cleaned, grease-free, otherwise you will get a cold solder joint. I use an iron with a 15-60 Watt range set at 15-20 Watts and a tinned tip, never found the need for one of those expensive temperature controlled models as it's a different technique to soldering brass. I use low residue organic flux, gets the solder flowing beautifully and no clean-up necessary. Keep away from 2-part epoxy, make a mistake and the parts will be in paint stripper for the next month while the epoxy dissolves. As soon as you clean the metal a thin oxide coat forms, that's what the epoxy will stick to unless it's done immediately after preparing the surfaces. 5-15 second gap-filling CAA works if the parts overlap and are cleaned immediately before gluing. and is a must for the detail bits. Just don't drop it, parts will fly everywhere. Having built a few rail kits and a good many bus kits in white metal, I prefer the 5 minute epoxy glues (Araldite is my favourite). The bond is not as difficult to remove as the 24 hour stuff if you get it wrong, and it has a small amount of resilience to cushion the model should you drop it at any time (perish the thought, but this has been useful when buying pre-made kits from eBay and the like as it stands the rigours of postage much better than super glues). Superglues, in my experience, don't work too well on edge joints with white metal because of the porous nature of the metal. This results in fairly brittle joints, When buying second-hand models for rebuilding or reconstruction, this has been an advantage in that by the time the model gets to me in the post, it has become a kit of parts again ... ideal for my purposes as it is a much cheaper way of obtaining the kits than buying overpriced unmade examples! Solder is also a good method but I have never been that competent at delicate soldering with low-melt solders, although I once repaired a badly cast tender side on a K's Q1 using normal melting point solder. I built up the layers slowly a little at a time until the missing bit of the casting was all filled, then filed it back to match the profile. No one told me you can't use normal solder with white metal, so I did it! Sometimes, a combination of all of the above may be advisable. Superglue for a quick joint where there is danger of slippage, then epoxy or solder for strength. No experience with whote metal kits David - I've always read that it's not the easiest of materials to work with so have avoided it. However, I do have some experience (a little) with BEC motor bogies and don't like them !!! To me, they seem like a "blast from the past" - we've moved on from the old clunky 3 pole motor that's either "full on" or "off". Not good news for trams I fear. Try Halling of Austria. More expensive, yes, but (IMHO), light years ahead of BEC. I'm usually disappointed by the lack of scale speed on tram layouts. Most seem to run at a scale 200 mph and catapult the poor passengers into either the back or front windows depending on whether the tram is starting off or stopping. Halling motors are far more controllable. Srman brought up the issue of porosity. 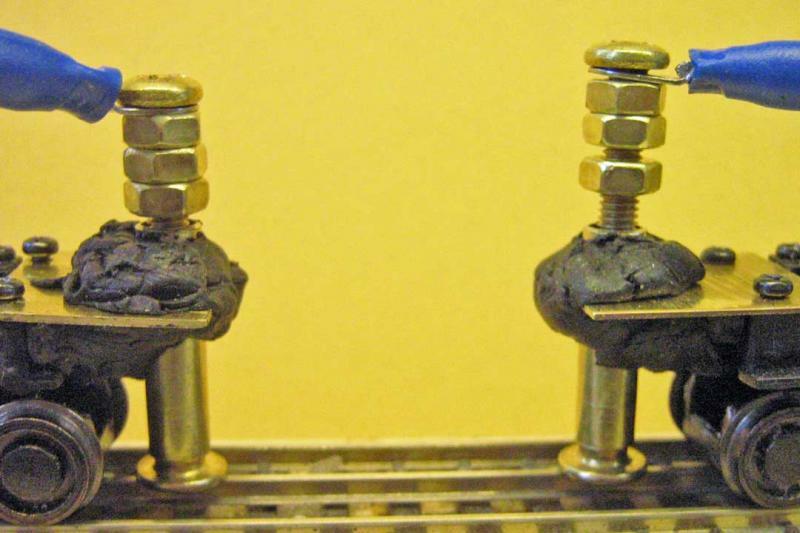 If the molten metal was degassed (which it should have been but you are at the mercy of the caster) and was cast in a centrifuge porosity is not an issue, especially for slow curing CAA which likes as much surface as possible. You do need an overlapping flange which hopefully was designed in. If not solder it. My experience with 5 minute epoxy is that the adhesion is questionable unless it is used immediately the metal is cleaned. It gets as hard as regular epoxy after a week or so anyway. It's worthwhile enquiring what the white metal melt temperature is. It can range considerably depending on the alloy composition. I would use a big, slow rpm high torque motor and use it to drive bogies with high ratio gearing. Hollywood Foundry Lowboy is worth having a look at. It's worthwhile enquiring what the white metal melt temperature is. It can range considerably depending on the alloy composition. I did a Google for white metal melting point, evidently it can be as low as 135C up to about 350C which is why I would not like to take a chance wiyh an iron that only goes down to 150C; if possible try and find a spot on the model to test that will not be noticed or which can be easily filled if you do melt a bit. I usually fit brass buffers in place of any supplied white metal ones, so a buffer is a handy test item. I prefer 70C lo melt solder, which is well below white metal melting point so an iron with a min 100C is fine. I'm with Mike, 100°C no tinning required or even 70°C solder (ideal for putting brass bits on after tinning). I've had kits where my iron set at 15 Watts melted the castings (OK if tack welding) and others where 25 Watts was perfectly fine. All that white metal acts as a very efficient heat sink, the idea with the solder is to use the iron to get it to follow the flux, not to heat all the metal so that the solder melts and flows in. Hence mu use of organic flux. Adding brass bits is different, heat the brass to melt the tinned solder. Thanks for the various comments. On trhe subject of soldering I am wondering if it is more like welding on cast models. If the metal itself melts at such low temperatures is soldering actually possible? Metallurgy was never my best subject but I remember the diagram that showed the lowest melting point for alloys and it was very low for some. One even below boiling point of water, used at one time by plumbers to aid bending of pipes. I think BEC bogies just use a standard model electric motor much the same as everyone else. They are significantly cheaper, at least in the UK, that some of the stuff on offer. I would assume glues are the way to go. If they are good enough to hold planes and cars together then I suspect they are fine for a model. From the comments it looks as though simple assembly jigs and fixtures help while the glue sets. There is a new product on the DIY market called SUGRU. basically a room temperature hardening rubber. Check out the site, sugru.com I think. I have tried it out on some models and it seems to work. It certainly works as a general repair product. PS further observations always welcome. Just remembered. SUGRU application below. If you look back to my post #10 on Tuesday, White metal alloy lowest melting point 135C, (some alloys though can be as high as 350C) low melt solder 70C, soldering iron at min setting 100C, that sounds like soldering to me, an iron with a minimum setting of 150C could well be welding if used on 135C white metal! I think you are right. From my limited knowledge of the normal casting metals they have melting points well above normal soldering temparatures. Really low melting point metals are probably for specialist applications and prices to suit. White metal casting is one technique I have always fancied having a go at. Taranti sell a started kit and Irish model soilder companies stuff is widely available. Cannot remember the name but many, many years ago on a motorcycle tour of Ireland we are riding down this road out in the country when a sign appears for the model soilder company. Prince August (Hoobies Catalogue) , basically a shop attached to the factory. I do not know if general purpose 3D printers have the facility yet, but one application of 3D printing is to print complex forms with casting wax and then use the model to make a lost wax casting mould. You're a braver man than I. Just make sure you clear it with the authorities, they look askance these days on backyard foundries. Plus you'll probably need the scrubbers to limit environmental pollution from all those metals. I looked into this a few years ago, stopped after it got past 5 figures. Resin casting is a lot easier, but poses another set of environmental and health/safety issues. Brass etches in comparison are easy, do the artwork and send it off. First one is expensive, the rest are not. Not good for curvy bits though. One of the reasons solder is getting more difficult to find (the low melt types) is that manufacturing facilities are becoming fewer. All you need to know about solder and soldering including catalogue of solder in bar, strip and reels. solder cream/paint and fluxes. ][size=Brass and white metal kits do not exist in North America (the odd ancient kit excepted), brass is RTR and $2000 up. My local hobby shop has a couple of brass tender kits, been gathering dust for at least 10 years. Sadly a lost art. No fiddly soldering iron here. adaptable to model railways i think. On a serious note, you need to have a partner when doing this, accidents with 220°C molten metal are not to be taken lightly, the same applies to the fumes being generated - molten lead/bisbuth have appreciable vapor pressures. You will need a positive air change system and a decent mask. I don't know about the UK, my civic authority in Canada gave me a categorical no! I suspect the same would go for UK Nigel - a definite No !!! In the past I have used a standard 25W soldering iron (either antex or weller) with 1mm copper wire wrapped around the tip and extending approx 1" beyond the tip. This worked well on white metal wagons. Built in 1969 using epoxy, Fell 18 inches (well it IS pre decimalisation) nose first onto a wooden shelf in 2014 and still runs. mixed experiences, my oldest model is now nearly fifty a Finecast N7 on its fifth chassis. Originally put together with old fashioned Araldite it has been transported dropped drilled scrubbed repainted and still OK (that's the old 24 hour type). most recently I have used superglue gel with fillets of five minute epoxy as reinforcement, I'm waiting for that one to fall apart. I have tried soldering but melted the bit I was fitting I"m not very brave so may not try again! You said that's the old 24 hour type, Ahhh the good old days Mind you, when I used it it was the latest thing . As far as soldering goes I seem to have a total block. I can gas weld, stick weld, mig/tig weld, braze and leadburn. Don't ask, it frustrates the "wotsit" out of me but I keep trying, and as I always say"Practice makes scrap".